When the weather outside turns frightful, the winning prescription includes: a warm cup of cocoa, a soft blanket, and if you're lucky, a cozy fireplace. For those with open floor plans, two-sided fireplaces are a great option. They act as a partition to break up a space, while also allowing light to flow through. If you're in the market for adding a hearth and mantel to your abode, take inspiration from these seven fireplaces that will help make winter a bit more bearable. A simple two-sided fireplace adds a cozy focal point to both the living room and dining room in this countryside cottage designed by Messana O'Rorke. The stacked logs amplify the wood features, while the contemporary coffee table and subtle, yet design forward, objects keep the space from feeling too rustic. 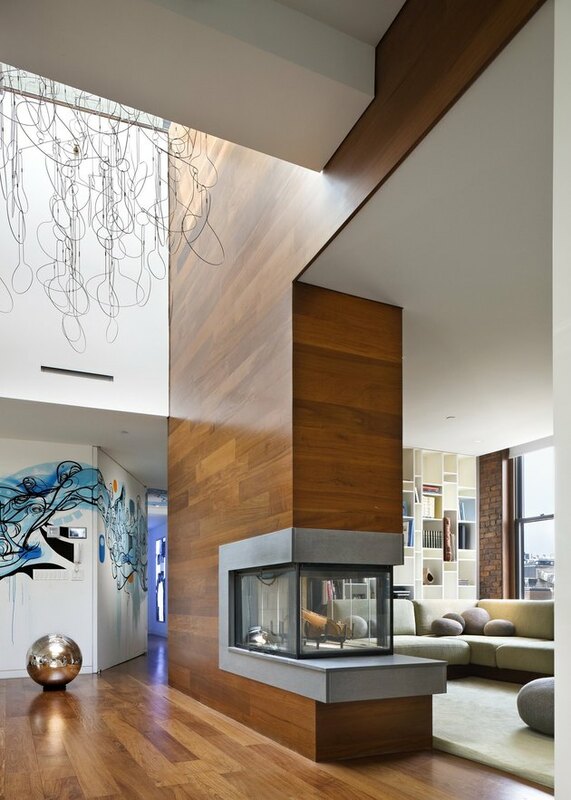 This open fireplace acts as a hub for socializing and entertaining. 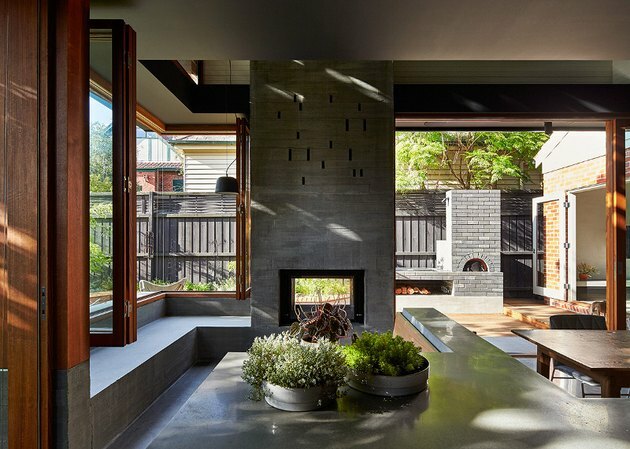 The concrete chimney connects to a concrete window seat, overlooking spectacular views of the garden from the oversize folding windows which bring the outdoors in. Just add some sheepskin throws and Moroccan-style cushions for a cozier ambience during the winter. 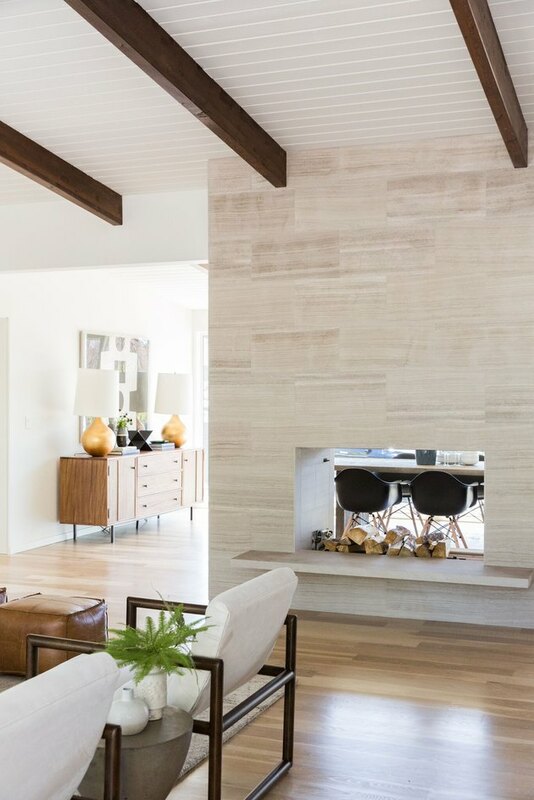 The warm tones in this midcentury living room and dining room designed by Shea from Studio McGee are brought together by exposed ceiling beams and a simple two-sided fireplace. The gorgeous veining of the stone keeps the design feeling contemporary and current, without losing an ounce of personality. This wood paneled partition designed by the team over at Joel Sanders Architect is the perfect example of how to divide a large space. One side of the room has a comfortable setup with an L-shaped sectional sofa and an area rug, while the other side is sparse with wood flooring that beautifully matches the wood-clad divider. Thanks to interior designer Jessica Helgerson, this stylish pad is a shining example of modern farmhouse style. 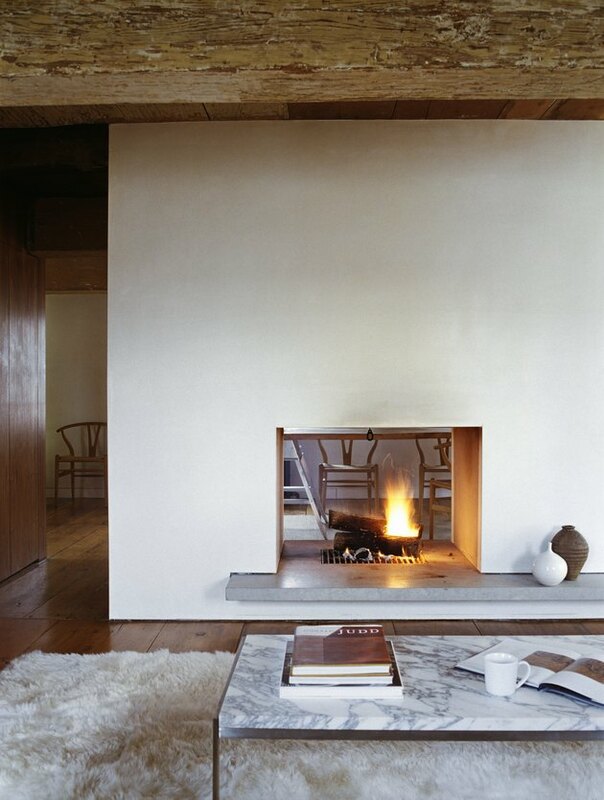 The white brick fireplace surround features a convenient niche to store chopped wood. 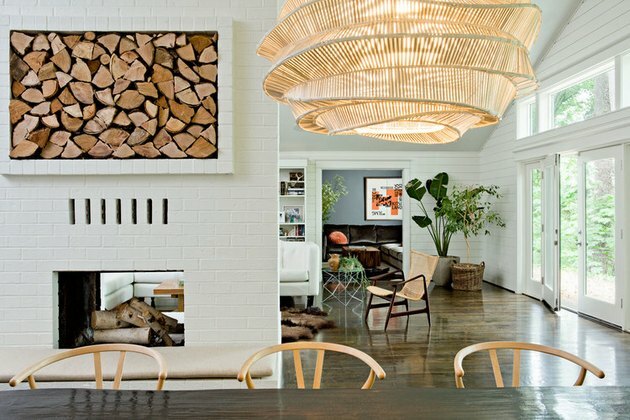 In addition, this clever storage space serves as rustic artwork for this dreamy dining room. The team over at Linc Thelen Design knows a thing or two about infusing drama into a space. 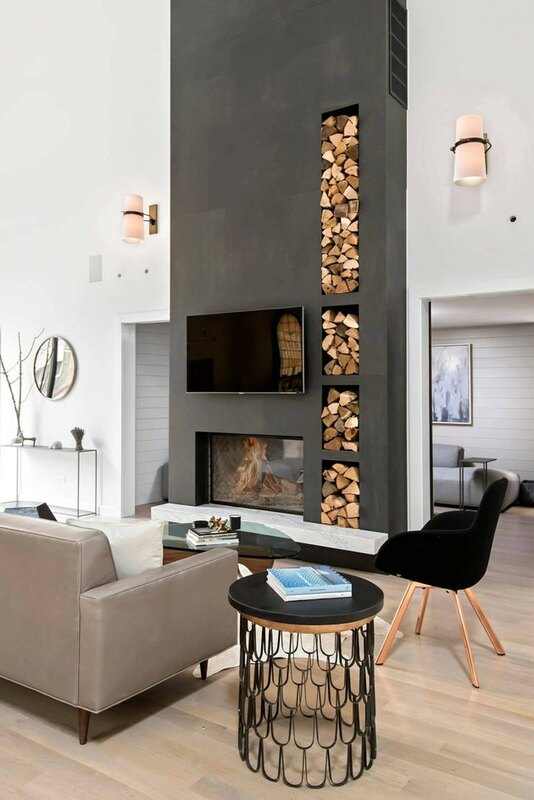 The striking matte gray, floor-to-ceiling fireplace takes center stage in this white living room while the stacked wood complements the other wood details throughout, tying the space together seamlessly. 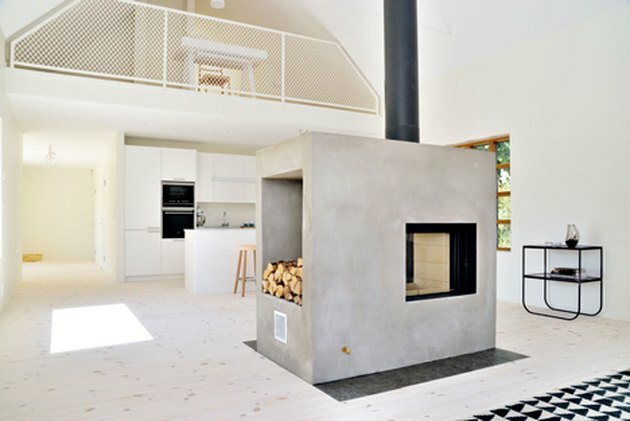 A concrete chimney with a double-sided, wood-burning fireplace is the star of this Swedish abode designed by Sandell Sandberg. Pale pine wood floors, high ceilings, and black accents keep the look Scandi-chic while the stacked logs add warmth and texture.